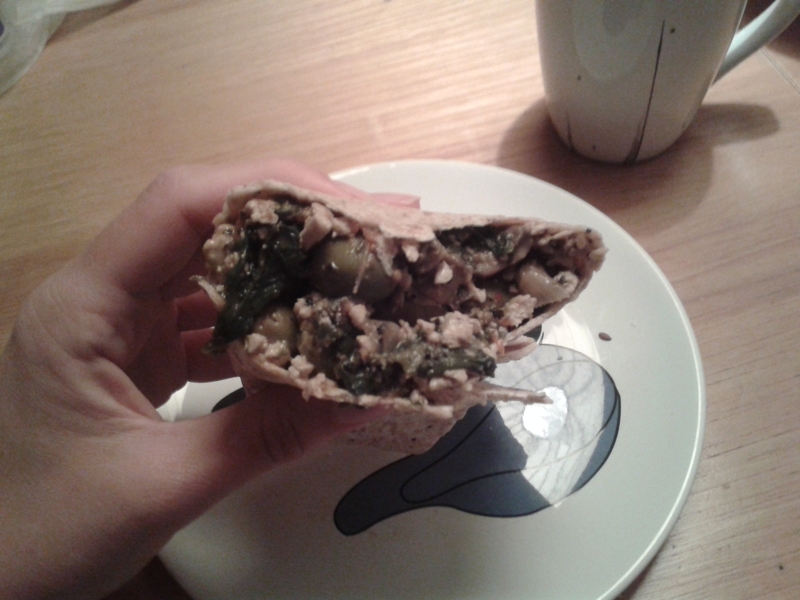 Mr Herbivore’s Heaven would have you believe he has to put up with a lot of nonsense from me. Every time I whip out my phone to take a quick, discreet photo of my meal in a restaurant, he huffs and puffs, taps his fork impatiently and moans that I never take photos of the food he cooks for me. Every time I “make a scene” at a restaurant (by which he means “politely ask the waiters about vegan options”) he rolls his eyes and hides behind his menu, trying to pretend he doesn’t know me. (For the record, he’s a vegetarian who doesn’t really eat eggs, so it’s not like we’re that far removed on the awkward-eater scale.) However, I believe he is quite handsomely compensated for these major inconveniences (a) by my delightful company, (b) by all the good vegan restaurants I take him to, and (c) by all the good cooking I do at home. Due to our schedules and the fact that he works more hours than anyone else in the world ever, I do the lion’s share of the cooking. But when he does take to the kitchen, he is a bloody good cook and I have in fact been known to take the odd picture of his culinary offerings. Above is his black bean and aubergine chilli, a Simon Rimmer dish that we both loved before we met and can now enjoy together. He usually serves it with home-baked tortilla chips, seasoned to perfection (nobody seasons food quite as perfectly as him). Most memorably, when I stored a cake stand at his house for a few days he decided that he must serve me a meal upon it. 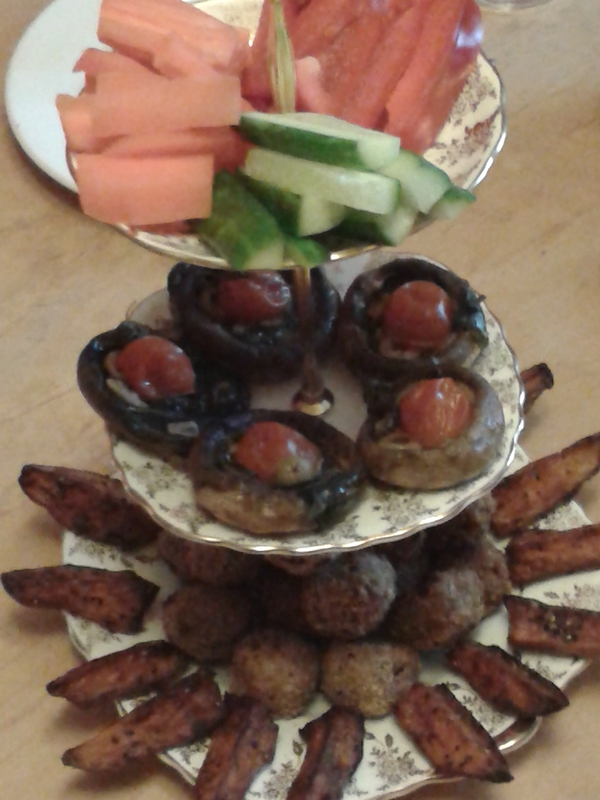 As he claims not to be a baker, it was not an afternoon tea but a mezze, including his world famous stuffed mushrooms and falafel. 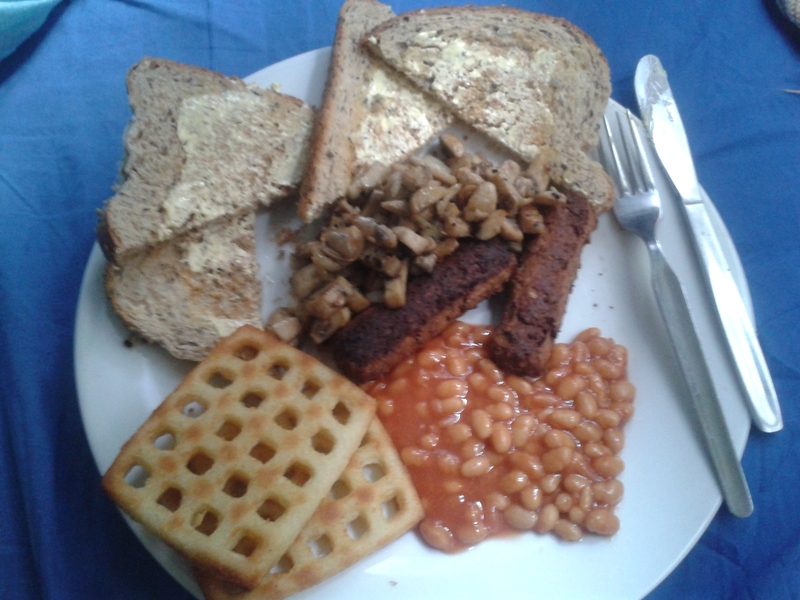 He is a master of cooked breakfasts – his full English has changed since the early days pictured above and now boasts a fancy tofu scramble instead of beans (he could quite happily pour a tin of beans over his breakfast, whereas if a drop of bean juice touches any other food, my meal is ruined), some crispy vegan black pudding and toasted olive bread on the side. The scramble keeps us in lunches for a day or two afterwards as well, and the leftovers even made the journey to Berlin with us in summer. And of course, his speciality. Curry. He has made me a fair few curries in a desperate (and thus far fruitless) bid to increase my tolerance to chillies. 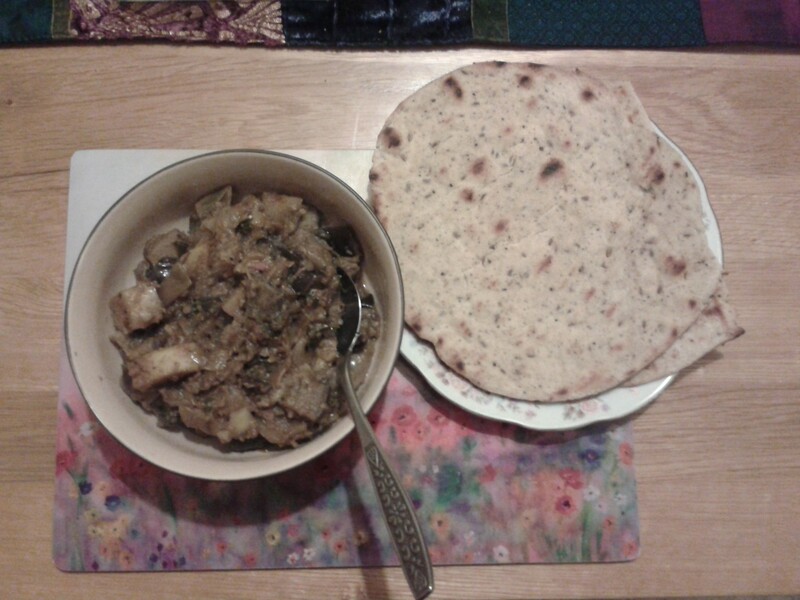 Here we have a delicious potato and aubergine bowl of fire, accompanied by homemade bread, as it’s surprisingly difficult to buy vegan naan in the supermarket. 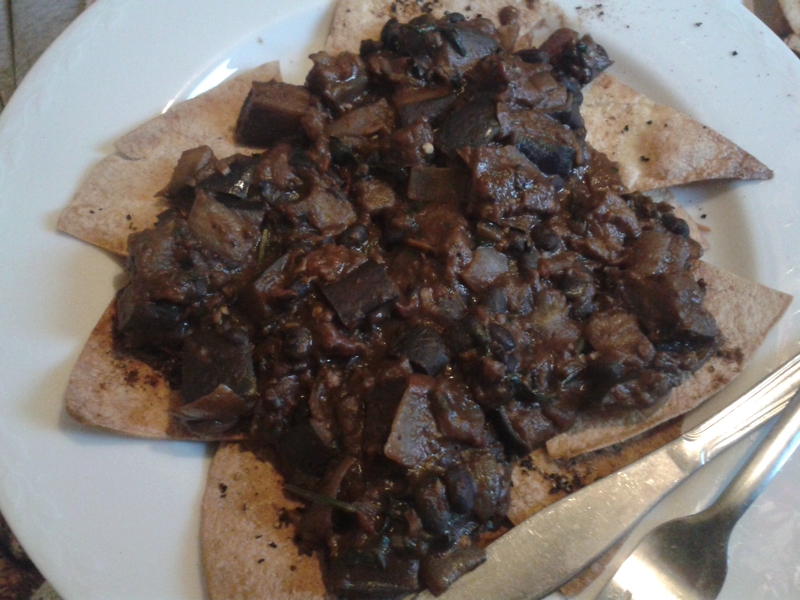 This meal was served with tofu covered in a herby marinade, a vegan take on a paneer dish. Unfortunately none of my pictures turned out well, but it was an absolute treat. And for all his claims not to bake, besides the naan he has also treated me to a banana bread during the Bake Off and a flapjack to follow the cake stand feast. However, none of those items survived long enough to be photographed. So for all that he berates me, he is in fact extremely supportive of my veganism. If only he’d cook more frequently!